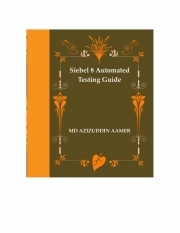 Description of "Siebel 8 Automated Testing Guide (eBook)"
This book covers Component , Product , Operating Testing with respect to Siebel. It also covers the Testing life cycle. It covers both White Box as well as Black Box Testing. This also covers Unit Testing ( UT ) , Integration Testing (IT ) as well User Acceptance Testing ( UAT ).It covers entry and exit criteria for all testing covered as well as the deliverables. It has a Sample full Regression Siebel Test plan. It has a comprehensive Glossary of Testing Terms & Terminology. It also covers Siebel Testing Best Practices. It also covers an Overview of All Siebel Applications , Configuration , Scripting , Workflows , EIM , EAI , Haley’s Authority , Data Validation Manager ( DVM ) , State Model , Visibility & Access Control Mechanisms. It also covers Siebel Recommended Best Practices for Configuration , Scripting , EIM and also configuration Guidelines. It covers Siebel Test Automation using QTP. Object Identification , Object Test , Table Test. Text Matching Test , Server Response Test & parameterization. Reviews of "Siebel 8 Automated Testing Guide (eBook)"